Gov. Rick Scott was in a cutting mood after the state Legislature passed a $78 billion budget earlier this year, but one $25 million line item escaped his veto. Senate President Andy Gardiner inserted a change into how vehicle-registration fees are spent and siphoned off $25 million annually for what he called the Sun Trail program, or in plain speak, bike paths. It’s not a lot of money as budget allocations go, but the bike community is thrilled nonetheless. “Anytime a funding source for trails is identified, it’s good news for the biking/walking community,” said Becky Alfonso, who runs the Florida Bicycle Association. Some of the money could go toward the Coast to Coast Connector trail, a bike path that would link Florida’s east and west coasts. Gardiner said the coast-to-coast plan would be a perfect for the money he had set aside. “That’s a tailor-made fit,” he said of the 250-mile plan that would connect St. Petersburg with Titusville. Right now, nearly 70 miles of the proposed trail is missing, although a $3.6 million piece in Titusville was started in 2013. Gardiner, an avid cyclist, has supported more bike-only paths and bike lanes on roads for years. He set aside $50 million two years ago for the Coast to Coast Connector only to have Scott veto it. Last year, Gardiner persuaded Scott to approve $15 million for the connector trail, but it was a one-time deal, not a recurring, or dedicated, funding source as this year’s appropriation is. “This is a good program. It’s an incredible opportunity,” Gardiner said. The estimated price to complete the trail is $50 million, though no one can be certain just how much it might cost until engineering and design studies are done. Regardless of final cost of the connector, cyclists contend it would be a bargain compared with road construction. For instance, the “Ultimate” rebuild now underway of Interstate 4 through downtown Orlando is expected to cost $2.3 billion. That’s more than $109 million a mile, while the Coast to Coast Connector would come in at $714,000 a mile if the cost is $50 million. 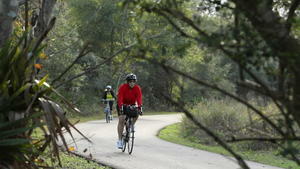 That path eventually would link up with several popular Central Florida trails that would become part of the cross-state trail, including the Seminole Wekiva, West Orange, South Lake and Van Fleet trails. But do not look for much of the money to be spent this year on bike paths. It takes time to set up a new program, state officials said. And that means the money now available likely will not pay for much in coming months. “Our hope is by the middle of fall, we’ll get a list of projects,” said Jim Wood, a Florida Department of Transportation manager in charge of the Sun Trail program. During the past five years, according to state records, bike enthusiasts have had to compete for money from a $48 million to $49 million annual outlay that also paid for landscaping, sidewalks, public-transportation shelters, lighting and overpasses and underpasses for people and wildlife. Read the original post in the Orlando Sentinel here.